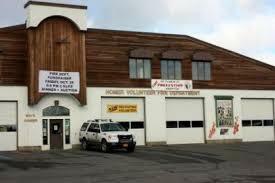 The Homer Volunteer Fire Department is seeking a new fire chief. According to a City of Homer press release, Former Chief Terry Kadel is no longer with the department after taking over the position just eight months ago. The release quoted City Manager Katie Koester wishing Kadel luck on his future endeavors, though it did not disclose why Kadel is no longer serving as fire chief. According to the release, Koester met with fire department volunteers to “solicit feedback on the department’s leadership needs and discuss the plan for moving forward." Fire Department Captain Dan Miotke will serve as acting assistant chief, a position formerly occupied by Kadel. That position has remained empty since Kadel took over as chief, and the city says it will be closing the application period for the job on Dec. 15. When the city will replace Kadel is not quite clear. The city plans to mount a national search for potential candidates. The Homer Volunteer Fire Department and Kachemak Emergency Services responded to a house fire in Homer early Friday morning. The Homer Fire Department was notified of the fire off East Danview Avenue at about 5:23 a.m. According to Homer Fire Chief Terry Kadel, the blaze was likely caused by a citronella candle burning on the front porch of the home. Late last month, firefighters stomped out three fires in just a couple of days. Two of those blazes burned mostly grass and trees, but one burned a cabin and everything inside to the ground. Alonzo Lang rented the cabin on his friend’s property. Now, he’s rebuilding both his own life and his 4-year-old daughter’s. But he’s not doing it alone. Lang is feeding his two pet pigs. Acting chief of the Homer Volunteer Fire Department Terry Kadel has been appointed to the position permanently. Kadel took over the position as acting chief in late January after former Fire Chief Bob Painter retired. He took on the position officially last week. Kadel has eighteen years of experience as an EMT and came to the Homer fire department after working with the Girdwood Volunteer Fire Department for 20 years. He began as a volunteer there and eventually worked his way up to deputy fire chief in 2001. The City of Homer has received a Staffing for Adequate Fire and Emergency Response, or SAFER, grant through Homeland Security for an assistant fire chief at the Homer Volunteer Fire Department.